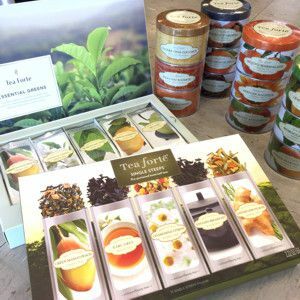 New from Tea Forte are their single steep loose leaf tea assortments. If you love loose leaf tea but want a simpler way to enjoy, then these pre-measured single steep packages are a great solution. Tea stays fresh until you use because they are packaged in sealed foil packets. If you like variety, Tea Forte’s new variety packs of loose leaf tea provide you 3 flavors, each in their very own tin. This is a great way to try new flavors or to mix up your flavors based on the day (or mood). Variety is the spice of life, afterall! Stop by our housewares department to see our full selection of Tea Forte products – on sale year round.